POP FROM ALL ANGLES: Is Willow Smith the Pre-Tween Rihanna? Is Willow Smith the Pre-Tween Rihanna? Hard to believe I'm just about to vouch for the progeny of William Smith. For a moment, let's survey the career of William Smith. Of course, if I consider myself "old school," which I do (test me), at 12, He's the DJ, I'm the Rapper was a watershed. Though I knew it was comical rap, commercial rap, not nearly as lethal as LL or Kool Moe Dee, it was enjoyable to see "Parents Just Don't Understand" in the ubiquitous spotlight it took hold of. But really, that honeymoon was short-lived. "Summertime" may have been the twilight of the Fresh Prince's career. I'll admit to watching the sitcom -- it was mindless and starred the "rapper." But I think it was Six Degrees of Seperation (I'll give him some acting chops) where his ego may have taken control //// and see Ice Cube //// and his musical endeavors laid bare for all to see. A joke. Big Willy beget Jayden. Now the Karate Kid and destined for some stroke of stardom. I guess his wife then beget Willow. Yes. Too young for the stage. For the Miley Cyrus cycle. 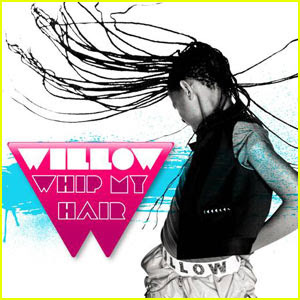 Still "Whip My Hair" is respectable teen pop, and packed with enough beat and pizazz to consider, that if her handlers stay this cutting-edge (yes, a Willow Smith song is cutting-edge) she could become the next Rihanna -- in 10 years. Which, to me, is saying something. "Whip My Hair" is mindless, like her father, sort of confusing, sort of head banging for urban radio, sort of bigger than "Umbrella" at the moment. Just sweet enough though that it's veering closer to Disney Radio than the Top 40 (though as of press time, it's #11 on the charts). Who knows? It's a bit too catchy to actually admit to loving.